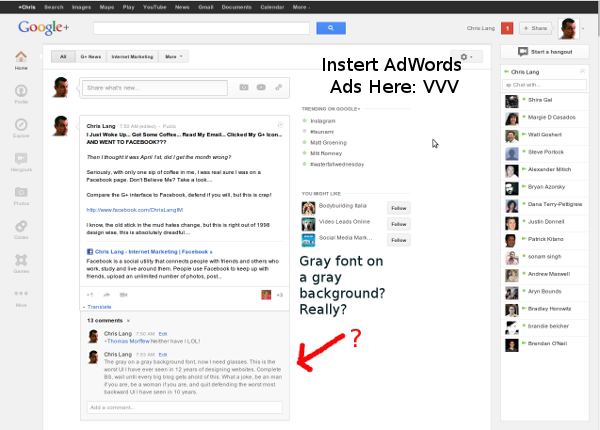 Hangouts On Air can now be embedded on a webpage. 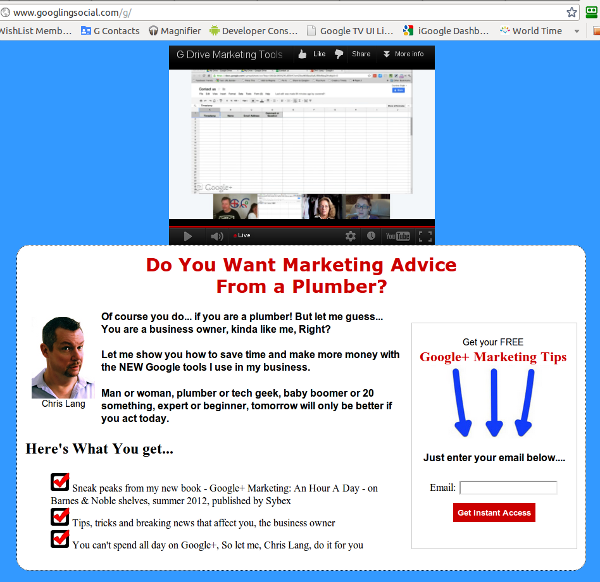 This is the first serious tool Google+ has given us to drive traffic and you can now see my weekly “Google Plus For Business” show at http://www.gplusknight.com every Wednesday at 7 PM EST on that page. Paste that single line of code into a webpage or a blog post. My advice would be to create a blog post like this one on the day or the show. As your show starts copy and paste in the embeded iFrame and hit save. Since it is the latest post it will be at the top of the blog on the domain. Just shout the domain now and anyone can easily see the streaming show. I myself suggest that is you are going to build a list, you stream your Hangouts On Air to your squeeze page. Here is the step by step instructions to the Form that Courtney Engle showed us how to create. Great example of what can be done with Google Docs forms here using a form to ask Narcissistic Personality Disorder Therapists to submit their credentials for inclusion in a directory site. Gdrive Help file: Publishing does not affect visibility. Gdrive Help file: About Gdocs Sharing. What’s New For Google Documents, an overview. ﻿The one glaring lacking feature on G+ is the inability to only share content either publicly, or with our Circles. 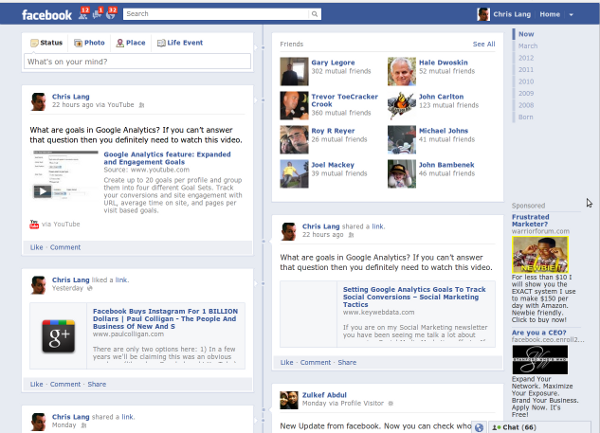 What Google+ lacks is the ability to make content only visible to those who FOLLOW me or better yet, one of my pages. There is absolutely no way to say “Follow my page to get premium content” that I only share with my followers.” +Jack Humphrey did a very good job of delivering a great video tutorial when you Liked his Facebook page. If Google sees that as incentivizing G+ pages and a violation of the Pages TOS then they had better rethink that one. Because instead of driving traffic here to build a page following I am instead driving it to my site. How to set up Google analytics the RIGHT Way! Get your questions answered live during the show by Chris Lang and his special guest panel…. The floating button sharing plugin is here and you can see it in action to the left of this blog post, try it out. Analytics plugin author Joost De Valk interview. Ileane’s Slide Share from her presentation. Here is Daniel Waisberg’s take away from the email tracking section of this post. Breaking news, we reveal in the webinar that Google will soon track Google+ badges on our sites and way more, Click the video below to play! Just who is Daniel Waisberg? Daniel Waisberg is the Founder & Editor of online-behavior.com, a Marketing Measurement & Optimization website. He is also the Owner of Conversion Journey, a Google Analytics Certified Partner that provides insights on improving the measurement and performance of websites. He has managed Web Analytics and Online Competitive Analysis for several websites being responsible for the measurement, analysis, and optimization of over a dozen websites.He holds a M.Sc. in Operations Research and Decisions from Tel Aviv University, where he developed a statistical model that helps to optimize websites using Markov Chains. Daniel is a frequent speaker & member of the Advisory Council of the eMetrics Marketing Optimization Summit. Youtube, the massively dominant video sharing website owned by Google, aims to spruce up its social networking skills through better integration across platforms, and hopes to more than double annual ad revenue in emerging markets like India, the top executive said. YouTube says it gets around 800 million unique users every month. India is the second-biggest source of content for YouTube, after the United States. Pickett said YouTube was working on areas such as the comments section of the site, which doesn’t allow users to log in from other social networking sites like Facebook or Twitter. Thursday, April 12th, at 7 PM EST, myself, Chris Lang and a special guest panel will be taking a tour of Google Analytics, Google Webmaster tools and the new social analytics tracking. NOTE: You may have to refresh that page to see the On Air notification for the webinar Thursday, US time. You get the lowdown on all these new tools and more. Checkout what we will be covering below and ask your questions in comments below in advance. If you need to translate this to your time zone, the World Time Converter can do that for you. 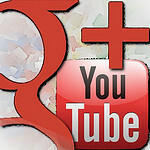 Seriously, I woke up, grabbed some coffee, read my email, then as always went to Google+ for my dose of news and tech. Then I thought it was April Fools. Checked the date. Thought I was on Facebook. Nope. Thought I had started my Windows 2000 machine. Nope…. They look just a little bit familiar don’t they? Good God Google? What have you done? Go thru my page, log in by allowing the app, and you are done. Want a custom vanity URL, for only $15 you get a branded URL and a branded RSS feed just like I do. The free version does the same thing, but based on your 21 digit Google+ ID. How many Chrome Extensions for Google+ will break? 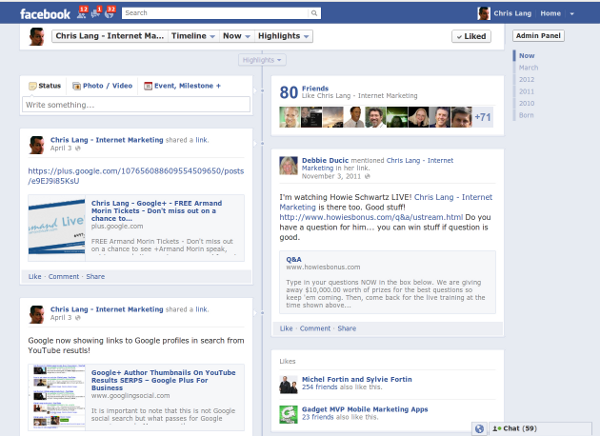 Mark Zuckerberg just threw up from launghing so hard at Google+ and I don’t blame him! Seriously, you all know I am a Google Plus fanboy going back to 2008 when I began to talk right here, on GooglingSocial.com about what Google had in store for us. This is not my beautiful home, this is not my beautiful wife. This is FACEBOOK! We believe that Google has finally learned their lesson, since 99% of all WordPress users don’t know how to even find the head section, read basic HTML, or have just about ZERO confidence when it comes to editing WordPress code files. WordPress users use plugins, that’s it. Without a plugin, they are sunk when it comes to adding G+ code to WordPress or Blogger either. Remember the main reason Google Friend Connect failed is it originally required you to FTP files to your site. Let’s hope Google has smartened up a bit. That site currently shows author thumbnails in search, but it does link to my Google Plus profile the old way. Now that I believe all it takes is the badge, I have removed the author links and now only use the badge on the site. If what I believe is true, then KeyWebData.com will continue to display author thumbnails in Google search results without using the old author links or the current author HTML tags. First off create a text widget in WordPress. 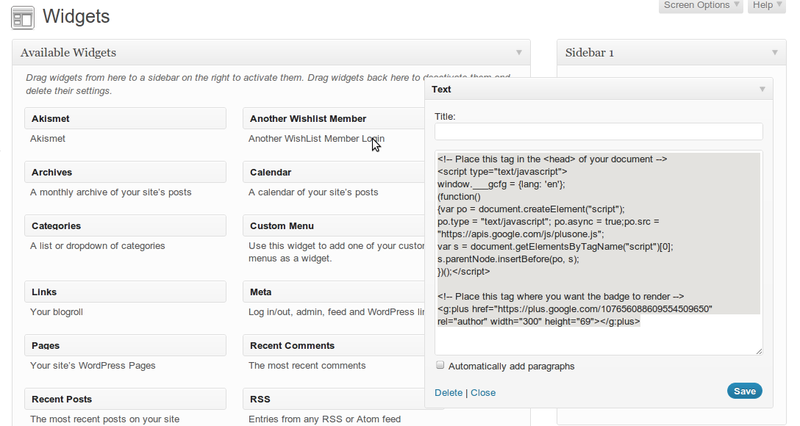 Log into WordPress, go to Appearance, then click Widgets. Once there drag a Text widget to your side bar. Get the badge code, right click, copy, go to step 3. Head on back to your WordPress Text widget, below the paste the code in. Click save. It’s just that easy, a caveman could do it! You should not see a badge like mine in the right hand sidebar of this site. If you would like to create a more interesting Google+ badge, I have some simple to code to make a phat G+ badge like mine here…. You can also see my site, KeyWebData.com using the exact code and validating here, and it has for over 9 months now using nothing more than a link tag in the side bar. 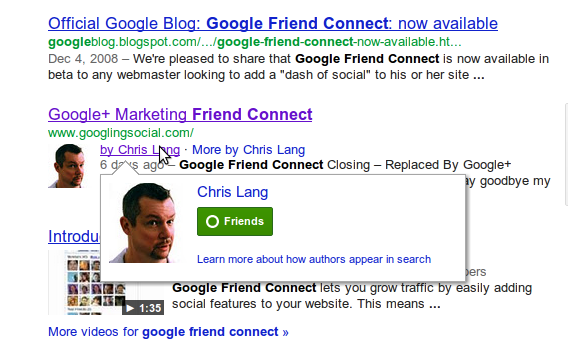 Remember that author thumbnails in Google search pre-date Google+ release in late June, 2011. Plus, there has been tons of changes to this code over time. If your code throws an error saying something is wrong, it’s is probably because you did not link to the site from your Google profile, or did not do so with the exact URL. You must link to the site we are testing, with exactly the same URL structure. 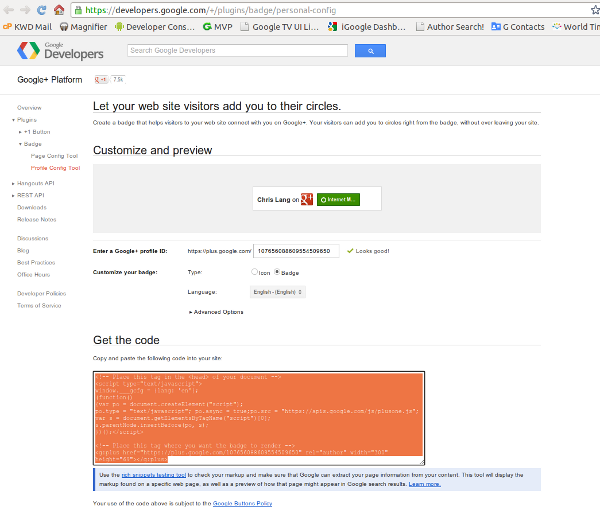 This possible error depends on your site setting in Google Webmaster Tools. If you have not set a preference to www. or the the lack of it, it will throw an error as you can see this site doing in the link, testing GooglingSocial.com without the www. in the URL. That means of you are using www. 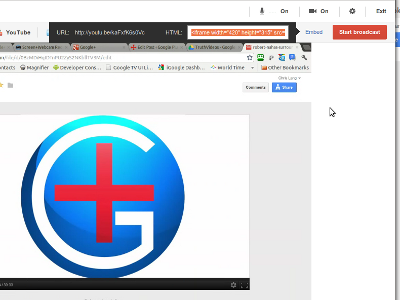 in your links from your Google+ profile, then you must use them in the testing tool. If it is a page badge you are testing, then the same thing applies, you must link to the site, with or without the www. in the URL. So if you have set your blog to always use www. in the domain or links, you must also use the same or you may not see the image from your Google+ profile. Add the author link tag to the head or not? Of course I advocate adding the link tag to the head section of WordPress. That file to do so can be found in WordPress by going to Appearance, then Editor, then opening the header.php file. But I wanted to show you that if you do not have the skills to do so, this simple badge can get it done for you today, without adding a plugin, or having the skills to edit a HTML file. 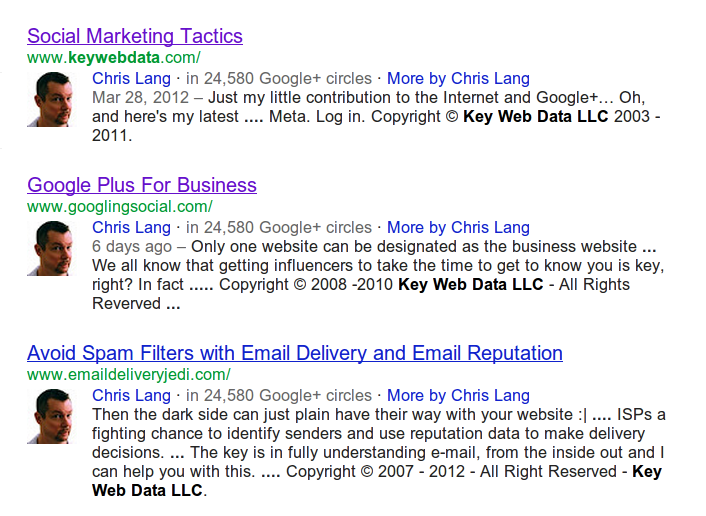 Google used to supply the link tag below in the badge widget I just showed you how to add. But now they have removed it in favor of the author url in the last line of badge code. There is some evidence that you have to add your author code to see the actual thumbnail image. If you feel the same way, here is the code to do so. So…. We will replace the YOUR-G+-PROFILE with the same 21 digit numeric string you got from your Google profile for the widget. We will return to this post later the week and determine if my site, KeyWebData.com, is still showing G+ author thumbnails in search. 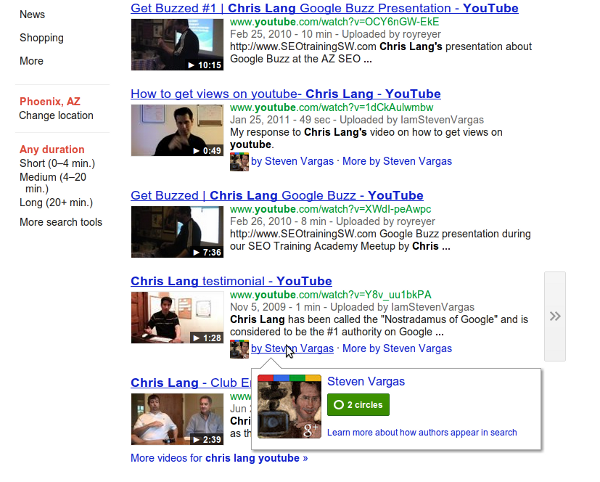 My friend Steven Vargas showed up in Google results with his author thumbnail showing yesterday. It is important to note that this is not Google social search but what passes for Google organic search. More correctly we now use “universal search” as Google called it when they began integrating images, news, YouTube and at times other video platforms years ago. Below is the step by step directions to create your own badge like mine you see here for WordPress and Blogger sites. Since you have already probably used the HTML gadget on Blogger or the Text Widget on WordPress to add your badge, it does not take much more to make it a better converting badge. All you have to do to add a personal image, business logo and a call to action to your Google Plus badge widget is add a few lines of code. Some themes like mine do not offer a bounding box or a header. Easy to fix. Just add this code to the first line of the sidebar widget. Both the HTML gadget on Blogger and the Text Widget on WordPress offer a Headline text box. Use that for a “Call To Action” headline like “Follow Google Plus For Business On Google+”… If that is not to your liking you can use an H3 tag to create a headline. 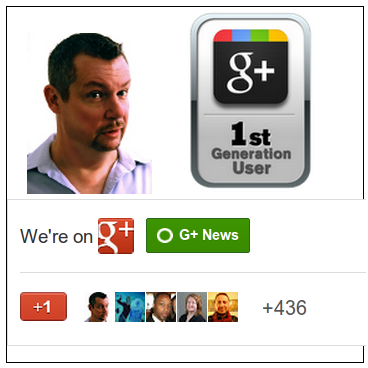 Just add that with your own headline text just above your G+ badge code line. Adding an image of yourself always has been a conversion king going back to my first day on the web in 1999. Here is how to add any image you like to the badge widget. That is all it takes to create an image in HTML. I would suggest that you use an image about 175 pixels wide so it fits the side bar well. All it takes is two simple lines of code to center your HTML in the side bar like mine is on the right. That is called a break tag, it puts what is called a carriage return or a paragraph spacing between HTML blocks of code. Right click that file and save it to your desktop. Then open it with notepad in Windows, on a Mac, open it with your text editor. Now just copy and paste that text into your text widget like the screen shot below, replacing the GOOGLE BADGE CODE with your own badge code or existing badge code in a widget. 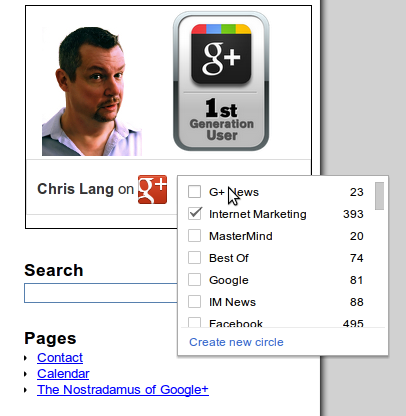 Just like we have seen Google Plus badges for business profiles that allow you to follow Google+ brand pages from a business website, now we have badges for Google+ personal profiles. The great news is that the code also comes with the author tag to easily and quickly set up your Google+ author link so that your author thumbnail shows up in Google search results for your blog. I you are ready to take your Google plus business marketing to the next level and have a business page set up then here is the link to set up your Google+ business page badge. I want to be sure that you know that the business page Google+ badge should only be used on a true business site, brand, blog or site that supports a local brick and mortar business. Only one website can be designated as the business website connected to the Google+ business page currently. The rest of your sites should use the personal profile badge as discussed above.